Banks were nearly five times more likely to repossess houses in long-term arrears than so-called vulture funds in the first quarter of 2018. According to the latest statistics from the Central Bank, between January and April traditional lenders such as AIB and Bank of Ireland held 29,206 mortgages which had been in arrears for more than 720 days. Of that number, the bank took 432 into their possession – either through repossession, voluntary surrender or abandonment. 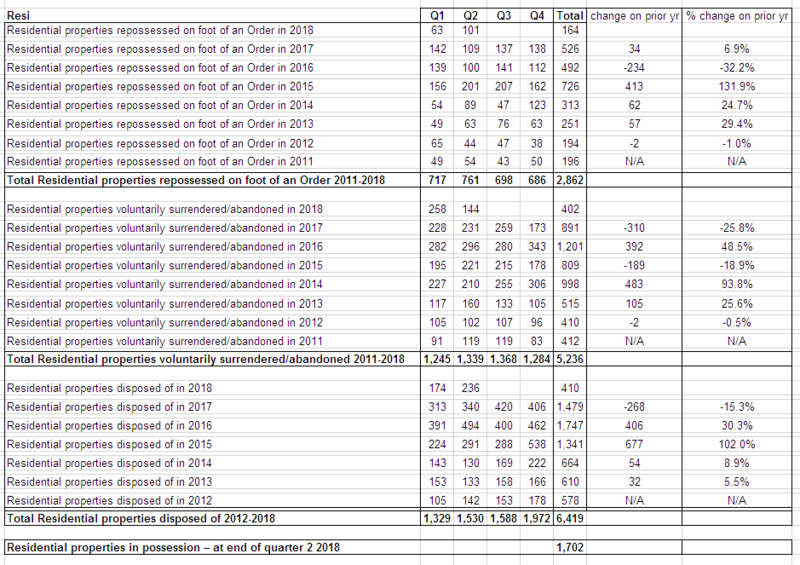 That means 1.48 per cent of all properties in long-term arrears to the banks were repossessed in one form or other. The figures include both personal homes and buy-to-let investment properties. Non-bank entities, including Start Mortgages, held 13,665 mortgages with arrears of more than two years, of which they repossessed 43. That amounts to just 0.31 per cent of the loans that these non-bank entities hold. In general, Ireland’s repossession rate continues to be extremely low compared with other European countries with high levels of arrears. So how are Start, Cerberus, goldman sachs etc. getting paid and funding this if they can’t repossess? They bought at a huge discount? Definitely and part of it could be timing i.e. they haven’t had the loans long enough to have exhausted the exhausting legal process before they gain possession! They cut deals with people to either sell or refinance. I presume the people who wisely strung the banks along for years by not engaging would now be wise to engage with these new debt owners? I wonder who the refinance is with. Please God there are no cases where the remortgage could be with an Irish bank…but nothing would surprise at this stage. (Effectively onshoring the bad loans made by British/Belgian banks to put the Irish taxpayer on the hook). Of course why not offer them new finance given their track record to date and their strong risk profile. Meanwhile credit is scarce for new first time suckers coming along, who will pay the highest mortgage rates in the eurozone, and be thankful for it. Eh… they will have no choice. Many of these debts are from people who threatened to lawyer up, mainly on spurious grounds, but grounds nevertheless that might cost the kind of money that lawyers can rack up very easily. The new owners just say - any legal issues, you sort that out with the bank after we’ve settled with you. ‘Failure to engage’ was the main criteria deciding which loans were sold on - the threat has been there for a long time and a few people (surprisingly few in my opinion) were smart enough to get out with very good deals - the ones that are left are going to get a pretty nasty shock - the deals struck will not be in any way to their advantage and if the politicians want to get involved they are welcome to do so but any softening of the blow will be with taxpayers money, end of story. Sir, – The latest bank bulk property sale looms with Ulster Bank set to sell 2,900 buy to let mortgages, and 2,300 other residential mortgages. The bank states that is has to sell the loans as over 10 years they have arrears averaging €3,200 per annum on buy to lets and €6,100 per annum on the other loans. Since the State propped up the banks when they needed it, where is the reciprocity for the State in our current housing crisis? Ireland should be given the option to pay the arrears through a preferential rate loan, to secure 5,200 homes. Ulster Bank would then remove the debt from its books, the State gets 5,200 homes, and the occupants of those 5,200 homes, could pay rent to the State, and avoid becoming homeless. Is the profit of this sale more important than the provision of 5,200 homes, and potentially many others in the months and years ahead? Our State has paid a high price to the banks. There is a problem with that letter. The banks are offloading both the can’t pay won’t pay and the can’t pay can’t pay portions of their books. If you put can’t pay won’t pay into a rental they will still can’t pay won’t pay …a lot of these are parasites. The state needs to be very firm with the can’t pay won’t pay lot no matter what ‘solution’ is cooked up for them. They should not get priority for housing over ordinary decent local authority tenants who pay their rent. If some carry on as they have done they should be out on their ears. Funny how the number given is €9.4m and €9.4m is the precise figure mentioned in this 2012 report on a well known ex Galway Fianna Fáil councillor named Josie Conneely. [ on the pin**HERE* * (https://www.thepropertypin.com/viewtopic.php?f=4&t=21157&start=30). Long-Term Mortgage Arrears in Ireland, by Terry O’Malley, examines the characteristics of Irish residential mortgages in long-term arrears, meaning those mortgages that have accumulated at least two years’ worth of missed monthly payments. The mortgages examined in the research were taken out on the primary home of the borrower with one of the five main banks in Ireland. The loan sample dates from July 2015 to December 2017. 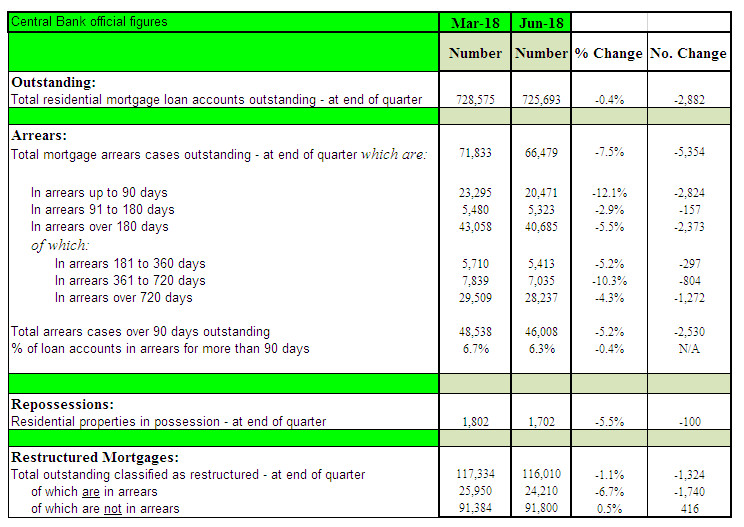 -While the number of mortgages in long-term arrears continues to fall, the pace of reduction each quarter has begun to slow. For the first time, as many loans are exiting the portfolio of the main banks as are curing to lower arrears states. 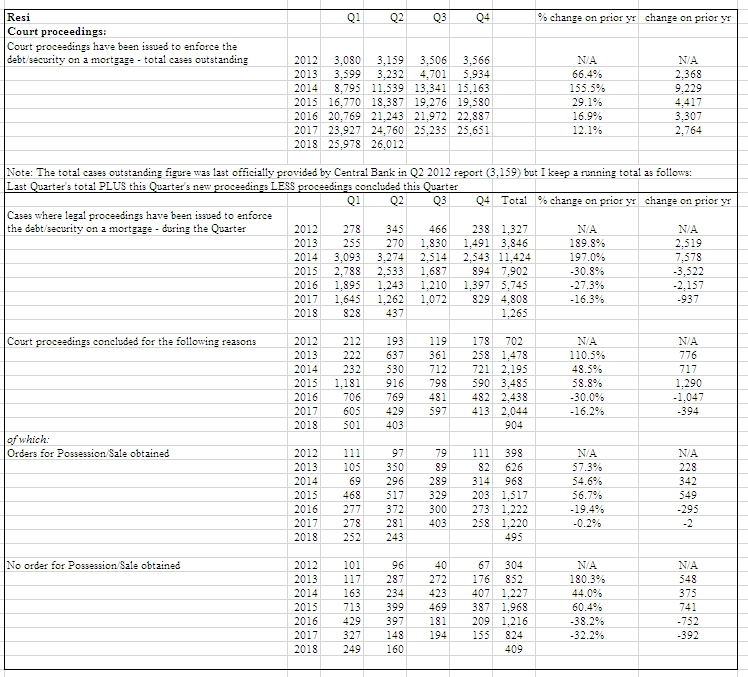 -As at December 2017, the average amount of missed payments on these mortgages is €66,409. 10% of the loans have accumulated over €129,148 worth of missed payments and half have arrears of more than €52,544. The average loan has arrears outstanding of around 23% of what the property is estimated to be worth. -Long-term arrears cases tend to have received a smaller number of modifications and are less likely to be currently modified. Loans that go through the Mortgage Arrears Resolution Process are twice as likely to end up in a lower arrears state six months later, compared to exit. This demonstrates the importance of borrower engagement with the arrears resolution process. The Irish legal system is to blame for the persistence of long-term mortgage arrears so long after the financial crisis, a new study published by the Central Bank has suggested. The report said cases involving long-term arrears (those with missed payments stretching over two years), were rare internationally because repossession proceedings were usually shorter. “The current legal system makes it difficult for banks to repossess collateral to resolve these loans, and so long-term mortgage arrears are the product of a long repossession process,” it said. Why is the Irish Times too coy to name the lady? Banks are still failing to agree realistic restructuring plans for people with distressed mortgages, according to a leading industry group. Brokers Ireland, which represents close to 1,300 mortgage and other insurance brokers, says that, in too many cases, lenders are merely “kicking the can down the road”. One-third of 116,010 restructurings that have been agreed to date involve “arrears capitalisation”. That means missed payments of loan interest and capital, and any other costs incurred by the banks in handling arrears, are added to the balance of the loan. “This is not a solution but a kicking of the can down the road mechanism, with the painful day delayed indefinitely,” says Rachel McGovern, director of financial services. “ The issue will eventually have to be dealt with. “We have always maintained that it is erroneous to classify such mortgages as restructured,” she said. The comments come as new Central Bank figures show the number of agreements with lenders to restructure distressed mortgages jumped during the second quarter after falling for a number of years. “That points to a lack of realism in the restructures,” she said. She argues that lenders need to face up to the “terrible dilemma” of “stubborn arrears” – those over 720 days, which account for 91 per cent of the €2.5 billion outstanding – with “real solutions”. I don’t see why arrears capitalisation cannot be classed as sustainable. If someone is able to make current payments today, but missed payments at some point during a period of unemployment or reduced income, then there’s no reason that can’t be a sustainable solution. As long as the capitalisation doesn’t involve the term extending beyond retirement age then there’s no reason the loan can’t be paid in full. Even if it does extend into retirement that could be resolved by downsizing and using the price difference to pay off the outstanding amount of the loan at that point. It sounds like these brokers are just pushing for write-offs to be the default solution even where they are not actually required. Hundreds of homeowners face renewed threat of repossession following a landmark judgment by the Court of Appeal. The three-judge court ruled unanimously that a man fighting repossession is not entitled to challenge the registration of a so-called vulture fund as the owner of a charge on his home.